La Colombe’s Gold Coast branch is at the start of East Elm Street on the corner of State, a block from the beach. I first came across it when I was in Chicago last summer, but I was on my way to a Cub’s game at Wriggly Field, so didn’t have time to call in. My return last week coincided with a period of extreme cold, the temperatures dropping to -30°C, so I didn’t get out much. The visit to La Colombe was a rare excursion for my friend Amanda and I before the temperatures plunged (it was around -10°C that day). La Colombe is on the north side of the street, set well back from the road, occupying a small unit in a much larger building. There’s a central set of floor-to-ceiling windows between two large pillars, with the (summer) benches outside, while the glass double doors are off on the left-hand side behind one of the pillars. Inside, the layout is very simple, with four two-person tables lining the windows at the front. The counter, meanwhile, occupies the back wall, with the retail shelves on the left-hand wall next to the doors. There’s also a chiller cabinet at left-hand end of the counter with the draft lattes and grab-and-go salads. The only other seating comes with four high stools at the far, right-hand end of the counter which is, by the way, shaped like a question mark, the stools at the curved part to the right. If you think of the chiller cabinet as the full stop, the till comes next, along with the cakes and menus, while the espresso machine is on the right, behind the counter, and the batch-brewers and pour-overs on the left, tucked in behind the chiller cabinet. La Colombe’s standard Nizza blend was on espresso, joined by a single-origin Papua New Guinea, part of its Workshop range of lighter roasts. Similarly, on batch-brew, there’s the Corsica blend and a Red Honey processed Colombian from the Workshop range. Finally, there were three single-origins on pour-over, with Amanda choosing the Guatemala Cerro Grande. Served in one of La Colombe’s classic mugs, it was clean and smooth and I really enjoyed the small sample I managed to extract. Meanwhile, I had the Papua New Guinea single-origin espresso, served in a glass. It was light and fruity, a really lovely shot, although it made Amanda pull funny faces when she tried it. Before I left, I bought a can of the draft latte and two of the cold brew shandy (lemonade and grapefruit). Of these, I liked the draft latte best: it was very smooth and full-bodied, but it’s not something I’d drink over a regular coffee if I had the option. The shandy was nice (and didn’t taste of coffee to me), but I didn’t really see the point of it. 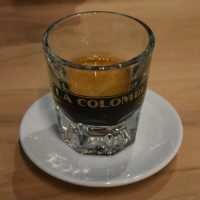 This entry was posted in Cafe/Roaster, Cake, Chicago, Coffee Shops, Evening Opening, La Colombe, Retailers, Saturday Short and tagged Chicago2019, include, La Colombe by Brian Williams. Bookmark the permalink.